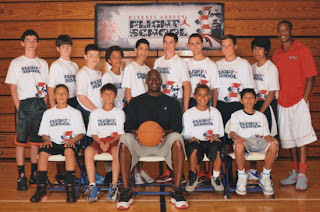 ajordanxi Your #1 Source For Sneaker Release Dates: Michael Jordan Spotted Wearing Possible 2013 Air Jordan 11 Retro Low? Michael Jordan Spotted Wearing Possible 2013 Air Jordan 11 Retro Low? While attending his own Flight School basketball camp, Michael Jordan recently posted for the annual picture wearing a very interesting colorway of the Air Jordan XI Retro. Next year, the Air Jordan XI Retro Low is rumored to be returning. After seeing it return earlier this year in a white and varsity red colorway, MJ broke out an all new colorway recently. The pair features a black mesh upper with white patent leather and a red outsole. This colorway is rumored to be releasing next year although it is not confirmed at this time and, the color placement is unknown. So, enjoy this sneaker peak brought to you straight from the man himself, Michael Jordan. Once I have confirmed information I will be sure to post it. For now, keep an eye on these as this might well be the colorway releasing sometime in 2013.